Discussion in 'Casual Photo Conversations' started by Mark Keefer, Nov 3, 2018. DIY If I can make something that works well and looks professional. DIY if it works, if it looks good great, if not who cares, I saved money and I get the job done. I prefer professionally made gear that looks pro, I don't care if it costs money. It depends on what I am going to use it for. I often have fun creating my own lighting projects. 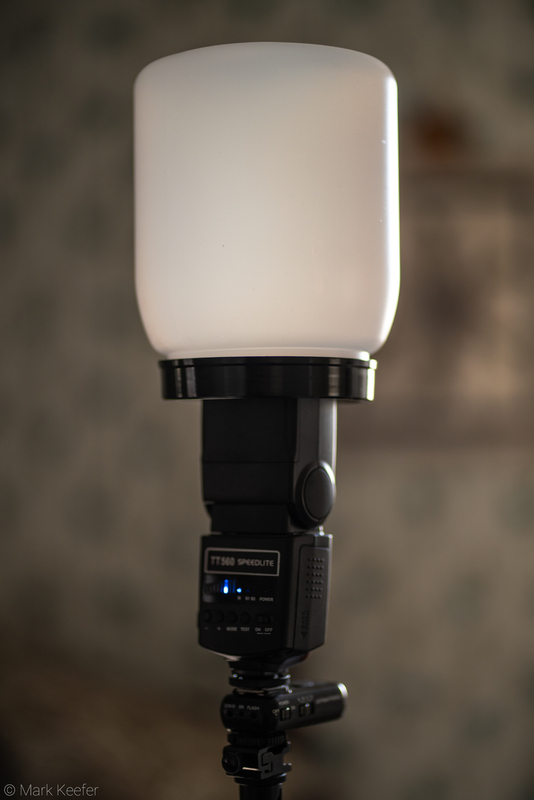 This speedlight DIY light modifier gives great soft smooth light and shadows and bounce and doesn’t cost $50 like a popular professionally made light modifier. It can be made with a 32 oz container of protein supplement sold at Walmart, Body Fortress Super Advanced Whey Protein Powder, 60 Grams of protein per serving in your choice of flavors, Vanilla, Cookies N' Creme, Chocolate, Banana Creme, Strawberry. I mix one scoop of protein powder with fruits and 2% milk making a workout shake full of yummy goodness before or after going to the gym. The hard workouts and protein shakes have a twofold benefit, I am getting healthier, stronger and in better shape and at the end of every 32 oz container of protein powder, I can make a new light modifier that cost me only $16 US with all the benefits. How is that for some added incentive. Here is a link to the Whey Protein Powder supplements I use that has the great light modifier container. 1. Use up all the whey protein supplement. 2. Remove the shrink wrap label from the 32 oz. plastic jar. 3. Trace the top of your speedlight with Sharpie Marker into the lid of the jar. 4. Using a sturdy razor knife, carefully cut out traced lines in the jar lid. Note, don’t cut the hole to large as you want this to be a tight fit onto the top of your speedlight. (If you over cut, you could use Gaffers tape or Velcro strips to make a good fit for your light modifier onto your speedlight. 5. Put the lid back on the jar, and slide the jar down over your speed light. 6. Mount the speedlight to a light stand or the top of your camera and you are set. That’s it, a great light modifier for $16 and you are getting ripped at the gym in the process. It is a win-win. 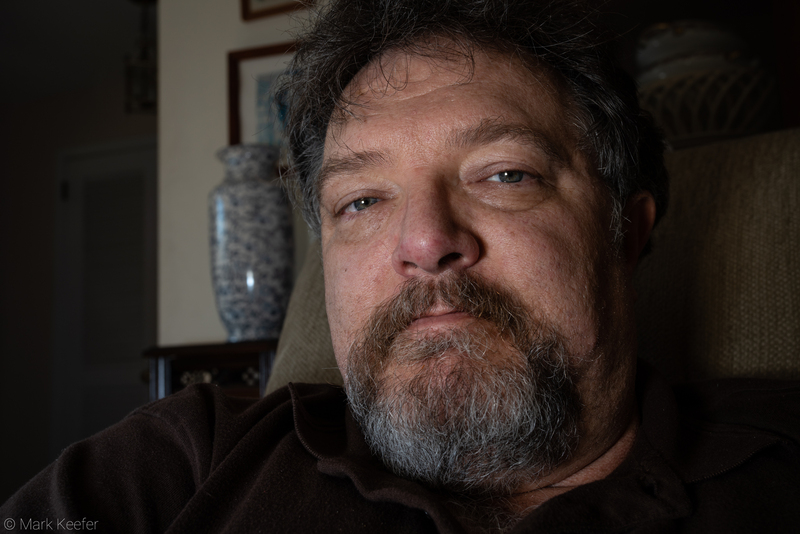 Here is a selfie portrait using this DIY light modifier. Hope you enjoy this simple DIY project. Enjoy. tholte, Jochen, stuart_pratt and 2 others like this. cheap is the father of inovation. philip_carlo_jorgensen and Mark Keefer like this. cheap is the father of innovation. Yep. I know I am not the only one who has looked at some of those $50 + flash modifiers and thought that is nothing more than a mayonnaise jar sitting on a speedlight. But I could romanticize this as I am an explorer, creator, inventor striving to master light, but wanting to save a buck works too. For myself, I can see a major drawback - I have never been to a gym in my entire life. I may have walked past one once . . .
Nick D. and Vincent Peri like this. Nice. I love a money saving idea. My personal favourite, cut a piece of scrap film and selotape it to your film leader to get 39 frames. ian_gordon_bilson, Jochen and Mark Keefer like this. Some people are blessed with great physic and some of us have to work at it, some just don't care. Look around, I am sure you can find another container filled with something that you prefer, and there is alway Gary Fong. As far as the gym, I had a choice of continuing to slow down and being out of shape heading in a downward spiral or start doing something about it. I got a good health check up, I was out of shape but everything was still working and the Doc gave me the blessing to start back at the gym. I eased into it, being in my late 50's, I was not out to become Mr. Olympia or to kill myself trying. So I am taking it slow, gradually building up weight, speed and stamina. Maybe in a few years I will get the physic of a Greek god, maybe not. lol. But I am glad I can get out and walk a couple miles carrying my camera and staying active. Better doing it now than after a heart attack. I also hired a trainer that I see two times a week, she pushes me and it makes it fun. It is money well spent if I avoid even one hospital stay after a heart attack or other ailment. Too sad that Walmart left Germany. But thanks for the inspiration. Maybe I'll spot an alternative somewhere. Stuart, this sounds great, post a couple photos or make a video. I am guessing it was an Auto Correct error. The auto correct on my android is both useful and an idiot very often. I rarely actually build these DIY projects, but I love to read them all the same. Thank you Gary, I’m only happy to be able to contribute to the amusement. Involuntarily or not. I am just a dumb Dane, with Danish as my first language and English something I learned a little about in School a very long time ago. Sorry if I from time to time accidentally happen to abuse your fine language and make a fool of myself. I should probably write and talk less and upload more photos instead. How about you, Gary? Would be nice if you in addition to your verbal stinging funny rebukes maybe also participated with just a few photos on your page? Or just one photo to start with? Philip, it wasn’t meant as a rebuke at all. I assumed English was not your native language. I went to school with several students whose first language was not English and always enjoyed helping them with term papers. Several counted on me to review their work for just such misappropriations of language. I actually find it quite endearing. And, having studied Spanish as a kid in school, I admire anyone who learns a 2nd language. Just thought it was a very “clever” error. I post to No Words. You’ll run across my photos there. I hate the way the galleries are designed and function so I don’t bother with a portfolio here. Some years ago, I was digitizing slides with my D70s and AI 55/2.8 lens. To get the right distance to the slide, I found a plastic bottle of the right diameter, cut off the bottem, and it fits just over the end of the lens. Maybe a rubber band to keep it tight, after painting the inside black. Put the lid on when not in use, to keep dust out. I had just the right length extension tube to focus at that distance. Thank you for your kind words. So you are a nice person after all. The beginning of a perfect friendship.